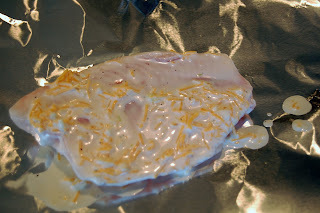 Until recently, I’d never thought of using foil packets to cook food in the crockpot and I never would have thought to cook fish in the crockpot. But a few months ago I found A Year of Crockpotting. This recipe for Tilapia comes from A Year of Crockpotting. It was a huge hit with everyone in my family, even the ones who don’t normally like fish. The sauce is flavorful. 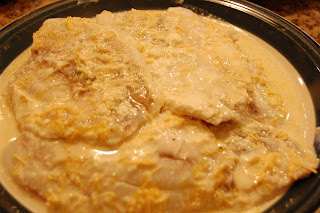 Cooking the fish in the crockpot didn’t give the house a fishy smell – another bonus. I didn’t really measure the mayo or cheese. I knew I needed a bit more since I was making 6 fillets, so I just eye-balled it. Stir the sauce together (all ingredients except the fish). I decided not to thaw out the frozen fillets. It just seemed like an easy step to skip and it worked out fine. Put the sauce on both sides of the fillet. Then wrap into a foil packet. Place all the packets in the crockpot, stacking them on top of each other. I was surprised that they took up so much space in the crock. I thought I might have room to wrap potatoes and put them on the bottom of the crock to cook at the same time, but there wouldn’t have been room. Maybe if you’re making less fish. If you try that trick, let me know if it works! Cook on low for 3-4 hours. I started mine on high for about 30 minutes since I started with frozen fish, but I don’t know that I needed to do that. The fish should flake easily with a fork when it’s done. YAY! Thank you so much, Tiffany, for letting me know that you tried this! It’s hands-down my kids favorite fish, ever, and I’m so glad that your family liked it too. I LOVE how fish in the crock turns out with no fish smell, and I’m thrilled it worked so well for you. This sounds wonderful! We will be trying it very soon! Great idea. Very timely, what with us Catholics giving up the meat this week and all. I do hate the 3-4 hours on low. I need it either longer (like 6-8) or shorter. I guess I could do some on high, or have it ready to go as soon as I got home from school and just eat a little later. Any thoughts? You are some amazing cook..that’ all I have to say, after eating vegi- sausages and a grapefruit for supper. 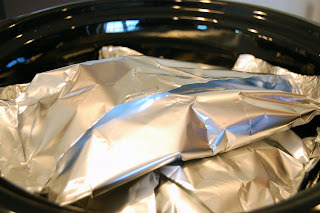 I was wondering just the other day if I could use aluminum foil packets in the crockpot. Thanks so much for answering my unasked question! Thank you for this recipe and the tips and turning me on to this site! My post today is on SMOKIN’ POT! I put a link in my post today for all the trouble I’ve caused today. Mmmm, you have crockpot recipes! I will be back to see more later. I am a fanatic for cooking in mine. Oh My Goodness…. One is never too old to learn something new every day..
i’m a big fan on talapia…i will have to try this!! The Year of Crockpotting site seriously blows my mind. Glad that you came across it too. Seriously…365 days in a crock pot. That woman deserves a medal! Thanks, Tiffany. I keep trying to make fish for my family, but I haven’t found many recipes they like. This one sounds just right. They will love the sauce, and I love using my crockpot. Wow, that sounds delicious. 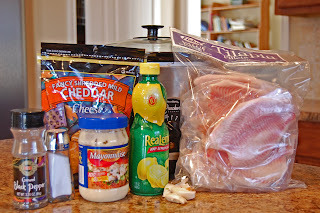 I would have never thought of making fish in a crockpot! All I have in my refrigerator is tilapia and I just bought a new crackpot so here is where Pinterest came in and saved the day! I tried this using frozen tilapia filets and parmesan instead of the cheddar, and it came out great! I increased the cooking time by 1/2 hour and it was perfect. I also made up a packet of cauliflower, broccoli and carrots and stuck it on top of the fish packets. My kids loved this recipe and have asked me to make it again. I’m addicted to your site now and have told several friends about it. Thanks! I have also made something similar using the broiler and parmesean cheese. Delish! You wouldn’t think it would be good, but the mayo and lemon juice really work together to give it a great zing! I’ve made this recipe and it was great! Thanks. Fist time user of crock-pot…. do i add water to the bottom of the pot before adding fish in foil? Nikki, you won’t need to add any water. Nice recipe. I also added some sour cream to the mix. Served with Asparagus with Hollandaise sauce. Thanks for the ideas. Hello 🙂 I found this recipe easy and very delicious, especially for a busy college student like myself with hardly anytime for “at home meals.” What other recipes do you recommend on your website that are just as simple for the slow cooker? Also, can I achieve the same results of this recipe by putting it into the oven? The sauce gets drizzled over the fish inside the packets. Tried this last night…Yummy! I’m not a big fish fan but this recipe may just change me. Flaky and delicious. I served it with plain broccoli and rice. The sauce covered all and was wonderful. Thanks! Just finished prepping my tilapias and added some broccoli florets into the packets — and shredded imitation crab into the sauce mix — into the crockpot and waiting for a delicious and successful dinner tonight! Thank you!!! This may be a silly question but can I use just regular tin foil, or does it have to be the foil packets? You use regular foil and fold it into packets. I suppose it might work to put it all into the crockpot together though, with no foil at all. The fish may want to stick together though. How long would you cook this in the instant pot? My family loves this recipe! My son even likes to bring it to school for lunch, and eat it cold! He just told me everyone wanted a bite!